You have probably seen this knife before. 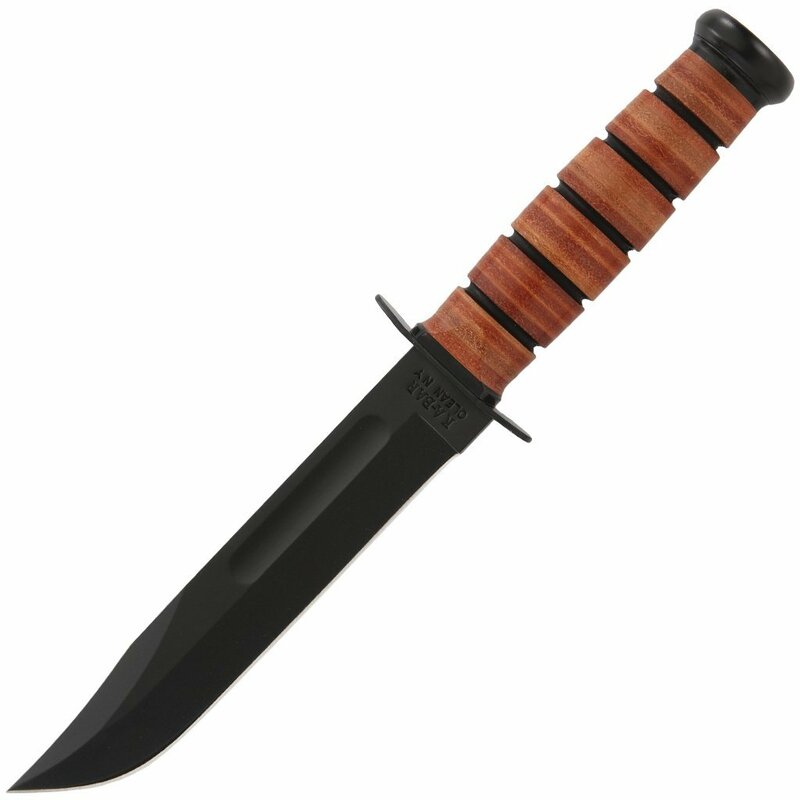 The KA-BAR 1217 USMC knife is one of the most recognizable fixed blades out there and was originally manufactured for USA fighting troops in WWII and is now more commonly used as a hunting knife however it is still used by some servicemen and women. This knife was made not only as a combat knife but also a utility knife so it serves well in that field as well. This beautiful blade is 7 inches long, making it quite longer than a lot of other blades out there. The blade is made out of 1095 Cro-Van steel which is really top notch quality and is going to last you a long time. You would have to really put this knife through some stress and wear and tear before the steel starts breaking. The handle of the KA-BAR 1217 USMC knife is made out of genuine leather and is really comfortable in your hand. You are able to get a solid grip that is easy to maintain especially when put under pressure. My only complaint here about the leather is that is can go moldy after a while if it gets wet, compared to rubber handles that you may see on other knives. Overall, when you are purchasing the KA-BAR 1217 USMC knife you are not just purchasing a knife, you are purchasing a piece of history. Every knife is stamped with USMC and you will honestly just love this knife. KA-BAR go through incredible quality control procedures to ensure that each and every KA-BAR 1217 USMC knife is as perfect as the last. This really is a beautiful knife and if your local hunting store has one, I recommend you go in and check it out before purchasing just to get a feel for it (just because it is a bit bigger than some expect). Other than that, for around $70, you cannot get a knife as good and with as much history as the KA-BAR 1217 USMC, a truly magnificent piece work.